The 21st century presents considerable planetary challenges for mankind as far as the management of living beings, waters, and lands are concerned. Since these things concern all of us, we cannot put the entire responsibility of deciding which path to follow on scientists and politicians alone. Thousands of books, articles, films, and internet sources are currently available. Paradoxically, intellectual production has never been so - abundantly one-sided. It is difficult to find well-adapted responses: we lack the devices for disseminating remarkably diverse human experiences, and we need to improve the quality of our collective thinking..
Disseminating the largest number of quality informative documents in order to facilitate the creation of alternative policies for the management of land, water, and natural resources. 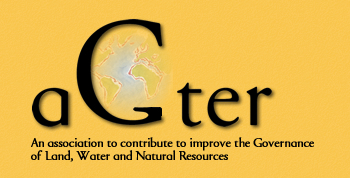 AGTER will develop a document database, and its prototype will be on-line shortly. AGTER is a NETWORK of persons. You can contribute to the work we started. - Work as volunteer with the association, wherever you live. - Send us brief brief article proposals in English, French, Spanish or Portuguese. - Translate articles or documents. 1. Make AGTER association, its members, its vision, and its activities known. The headers, The AGTER Vision, Who are we ?, The Collective Thinking Studies, AGTER’s Thematic Meetings and Other AGTER’s activities, allow you to get to know our association. You can get there through the menu to the left, as well as under the headers, website news and network news. 2. Make analytical texts and documents related to AGTER’s work or the work of its members electronically available. The thematic entries, land, water, and living beings are available by clicking the buttons on the top of the page as well as though the menu. Click the ? button to see legal information concerning the documents published electronically on this site. Click the other buttons to do a search of the site, to see the site map, to generate a printable version of an article, to contact AGTER, and to switch languages. Interested persons are invited to contact AGTER and subscribe to our RSS news feed.